Hamster hibernation habits are often poorly understood by even the most well-intentioned of hamster owners. In fact, countless owners have been frightened by the way that hamsters sometimes appear to hibernate, thinking that their cherished pet has passed away. We’ve thoroughly researched this topic to help you tell the facts apart from the fiction. Hamsters are not, by nature, hibernating creatures. In the wild, they tend to exist in regions that don’t get very cold. This means that there is no necessity for hibernation. However, there is a hibernation-like behavior that owners sometimes see in domestic hamsters. It’s referred to as a “state of torpor.” When faced with cold temperatures or a lack of food and water for a period of time, hamsters will become limp and motionless in hibernation, or torpor. This can happen any time of year but becomes more common during the winter months in some climates. Of course, this can be worrisome. Loving hamster owners likely want to prevent their pet from entering this state in the first place. 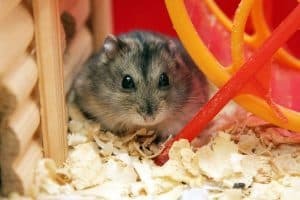 While it might be alarming to see your seemingly healthy and happy hamster motionless and limp in their cage, knowing the facts will help you to stay calm in the face of hibernation behaviors. 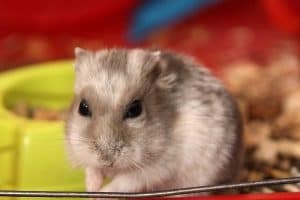 Continue reading this informative guide to hamster hibernation to learn exactly when and why hamsters exhibit this behavior. Below, we’ll share with you everything that you need to know about hibernation/torpor behaviors in hamsters, as well as what to do when you find your hamster in this state. The question of, “Why do hamsters hibernate?” entails a two-part answer: Wild hamsters do not hibernate, though domestic hamsters are known to get into a state of torpor under certain conditions (more on that in a minute). Hamsters typically do not hibernate when they are in their natural, wild environment. This is because they tend to exist in areas that are warm and dry year-round, like deserts. When they aren’t faced with extremely cold temperatures, there is typically no need to hibernate. The cold can prompt a domestic hamster to hibernate, as can a perceived shortage of food and water. Hamsters do not necessarily hibernate in accordance to the season but as a response to temperature. If your hamster’s environment is still warm during the winter, thanks to modern heating systems and such, they will not hibernate. And what we loosely call “hibernation” here really means going into a state of torpor. So time to address that term! Torpor is a physical hibernation-like state in hamsters and other animals. This is intended to be a protective state that allows the hamster to preserve their inner resources and survive times where the climate is too cold, or when they experience a shortage of food and water. The hamster’s metabolism slows down significantly. The hamster draws fewer breaths and produces fewer heartbeats. This state can be alarming to uninformed hamster owners, as hamsters will often appear to be dead when they become torpid. You should look closely for signs of life before determining that your hamster is no longer alive. Throughout this article, we’re going to use torpor and hibernation interchangeably. In a sense, any hibernating animal goes into a state of torpor during the time of hibernation. The difference is that in real hibernation, this state is natural and should not be interrupted. In the case of pet hamsters, hibernation is not a desired state. That’s why the more accurate term for hamsters is torpor. But again, the two terms are very close so just keep this in mind as you keep reading. What Signs Should I Look for to Make Sure my Hamster is Still Alive? Because the state of torpor so closely mimics death to the human eye, many hamster owners have wrongly thought that their pet had passed away when they were really just in a state of torpor. It can be tricky to spot signs of life when they are in this state. Here are some signs that you should be on the lookout for before “confirming” that your hamster is dead. Shallow breathing. A hamster may only take a few visible breaths per hour, as respiration declines during hibernation. You can place a tiny mirror in front of their face to see if it fogs. If it does, even just the slightest bit, they are still breathing. Hamsters won’t move much when hibernating, but there are some subtle movements that they can make, such as the twitching of their whiskers or slight movements of the body. You can try stroking your hamster – gently, of course – to see if it prompts any type of physical response. One common approach to this is to place a single chip of their bedding on their body and see if, at any point, the chip moves during your pet’s hibernation. Look at their limbs. Are they limp, or just a little bit stiff? If you can extend their limbs without any effort, your hamster is likely hibernating and not dead. If the limbs cannot be bent or extended, or it requires significant effort to do so because of severe stiffness, this indicates that the unfortunate has happened, and your pet has been affected by rigor mortis. Look at their eyes. Though it seems impossible, hamsters can be in a state of torpor with their eyes wide open, half-open or otherwise partially open. This, without a doubt, often leads owners to think that their pet has passed away. The wide, blank stare of a hamster in torpor certainly looks alarming but is not necessarily an indication of death. What Behaviors Indicate That My Hamster is About to “Hibernate”? You can observe certain behaviors in your hamster that indicate his or her intention to go into hibernation, or more accurately, into a state of torpor. These behaviors may come about suddenly, as it can only take a few hours of cold temperatures paired with a lack of food and water to prompt hibernation. The most telltale symptom that your pet is about to go into hibernation is unusual burrowing of their bedding. While your hamster may be an avid burrower all of the time, you might see that they are burrowing especially deeply into their bedding or creating larger nests for themselves in one of the more protected areas of their enclosure. You may also observe your hamster shivering or shaking right before they enter torpor. How can I prevent my hamster from going into torpor? The most important thing that you can do to ensure the comfort of your hamster and prevent hibernation-like behavior is to regulate the temperature of your pet’s environment. Because hamsters are animals which exist naturally in deserts and similar environments, they cannot tolerate the cold for very long. For this reason, you should keep your hamster’s environment at a bare minimum of 65 degrees Fahrenheit. It is ideal to keep the temperature a bit higher than that, at a range of 70 to 80 degrees Fahrenheit, to better replicate their preferred climate. Temperatures higher than this may distress your hamster, as hamsters are not, by nature, very good with extreme temperatures in either direction. In their natural settings, wild hamsters will burrow under the sand to escape the stifling heat of the sun and keep their body temperatures regulated. When you keep your home between 65 and 80 degrees, your hamster will not feel inclined to hibernate. Another important factor that contributes to hamster hibernation is the accessibility of food and water. One study of hamster hibernation patterns discovered that, when deprived of adequate food stores, hamsters will more than likely enter hibernation (torpor). In fact, it is nearly guaranteed that they will. The same study also found that hamsters who do have stored food accessible to them are significantly less likely to hibernate. Less than half of the hamsters in this study who did have food stores available entered this state. So, really, preventing hibernation is a simple matter of regulating your home’s temperature and ensuring that your pet is given the food and water that they need. When these needs are met, hamsters have no need to conserve their energy in the way that hibernation allows. 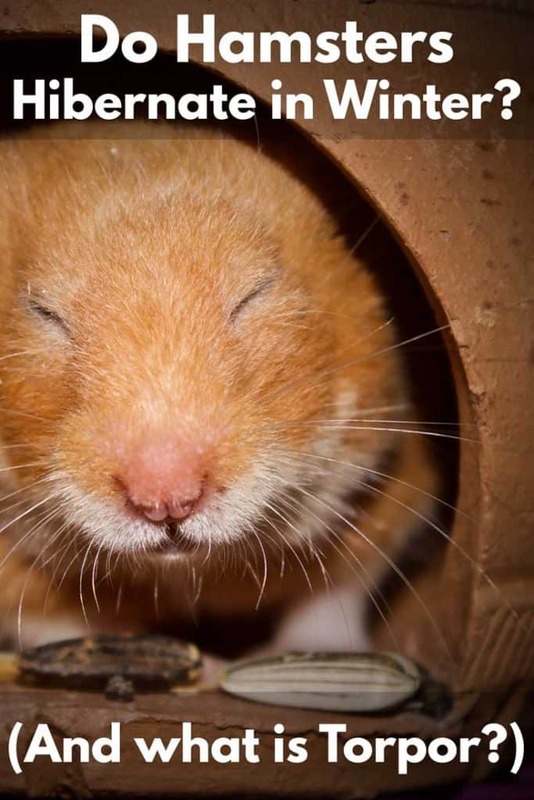 What Should I Do if my Hamster is Hibernating? In the wild, hamsters who are in torpor are vulnerable to a host of threats, including predatory animals and weather changes that jeopardize their safety. Domestic hamsters, of course, are not subjected to these risks if they are hibernating in their cages at home. Still, this doesn’t mean that it is ideal for the hamster to remain in this state. They can become dehydrated rather quickly due to their inability to drink (or do much of anything else, really) during this state of torpor, so it’s best for hamster owners to get their pet out of hibernation-mode as promptly as possible. If your hamster has been in this state for some time, it is advisable to bring them to the vet so that they may be given IV fluids. Dehydration is a very real risk for hamsters who have entered torpor for extended periods of time. Upon discovering your hamster in this state, you will find that they will be unusually cold to the touch. Body temperature drops significantly when hamsters are in torpor, so your first matter of business after calling the vet should be warming them up. Some owners make use of heating elements like heat lamps or heating pads to do this, but many veterinarians do not recommend doing so. These elements can cause burns to the hamster’s body that will require treatment. Instead, you should change the temperature in the environment. Turn up the thermostat or bring a space heater into the room (but not directly by the hamster’s enclosure). If the hamster has been in torpor for less than a day, this will typically be enough to gradually revive your pet from this state. It is also encouraged to utilize your own body heat to help your hamster warm up. Hold them gently in your hands, stroke their fur and pay attention to their behavior as they cease being torpid. You should use this time to massage their limbs, as this helps to restore healthy blood circulation in hamsters that have been hibernating. When roused out of torpor, your hamster may be very hungry. Most domestic hamsters do not have adequate fat reserves on their bodies to nourish themselves while hibernating, as they have not had time to prepare themselves for it. You should present them with their food, perhaps in small portions at first to prevent them from gorging themselves all at once. Dehydration, as mentioned above, is another concern that owners of hibernating hamsters must address. When your hamster is fresh out of torpor, you should introduce water slowly and in small amounts, such as with a dropper or syringe, to make sure that they can safely swallow the water. All of this can be done prior to getting your hamster to the vet, though the vet may provide additional water and nourishment to ensure that your hamster will be healthy after his or her hibernation. Your veterinarian will also be able to assess your pet for indications of other problems, like hypothermia. Even if your hamster seems wide awake and alert after coming out of this state, you should go into the vet for a check-up. After this ordeal, your hamster will probably be a bit stressed. After getting home from the vet, make sure that they have food and water and then leave them be. 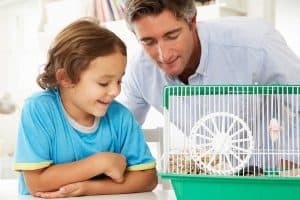 Avoid cleaning their cage and handling them excessively, if at all possible, until the hamster is no longer stressed out. A hamster going into hibernation means that there are problems in their environment that suggest that they need to reserve their body’s energy. Hamsters are not obligate hibernators and will only do so when the climate in their environment has become extreme and food is not readily available. By ensuring that your home is always a comfortable 65 to 80 degrees Fahrenheit and keeping food accessible to your hamster, they will not feel inclined to hibernate at all. Preventing hibernation in the first place is ideal, of course, but sometimes these things happen. If your hamster has succumbed to a state of torpor you should get on the phone with your vet, schedule an appointment, and work on warming up your pet in the meantime. If you know what hibernation looks like for hamsters, you will be able to act promptly to ensure their survival and overall well-being for the rest of their life. And now that you know what circumstances cause hamster hibernation, you can be proactive about safeguarding your hamster’s environment against them.